Seconds away from the hustle and bustle of Sauciehall Street is the enchanting GFT tucked away on Rose Street. It’s a comforting haven – especially the night before Christmas Eve. Instead of frantic shoppers and manic stares we’re greeted by the wonderful smell of mulled wine and mince pies. In true festive spirit, we’ve come to watch that Christmas classic ‘It’s A Wonderful Life’. It’s a first for my children but for my mum and me a welcomed nostalgic return. We’re well prepared with tissues that my children of course eye with disdain. 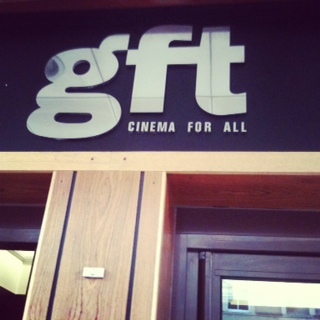 At anytime of year the whole experience at the GFT makes seeing a film seem so much more special. No unappetising bloated hot dogs and pawed over pick-and-mix, instead this stylised art deco building offers the Cosmo Cafe and a Balcony Bar. And here coffee and wine are acceptable alternatives. 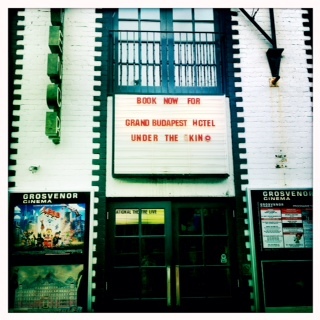 In addition to mainstream flicks they offer some of the best and most interesting in British and international films. It actually feels more like a night at the theatre than your average cinema, complete with a starry-filled curtains drawn back to reveal the film screen. The atmosphere is festive, magical even – and you can feel the whole audience responding with you to the film. The round of spontaneous applause at the end of ‘It’s a Wonderful Life’ is a first for me. So why not put some wonderful into your life and check the GFT’s fantastic programme. Indulge in a truly extraordinary cinematic experience in a beautiful building adorned with the legends of the film industry. Great value too, our family ticket for 4 was only £16. And on Saturday mornings they offer Take 2 free family films alongside a selection of films you won’t see anywhere else in Glasgow!